If you want to make sure that your programs are coordinated with others, grounded in a strong Monitoring, Evaluation (M&E) base, and iteratively adapted to remain relevant throughout implementation, you might be interested to learn more about the USAID’s Collaborating, Learning, and Adapting (CLA) TOOLKIT, - a set of practices that help you plan and implement Program Cycle activities more effectively. The purpose of M&E and Learning Practices is to apply Knowledge gained from evidence and analysis to improve development outcomes and ensure accountability for the resources used to achieve them. Learning from M&E means using M&E data/information as evidence for accountability and informing decision-making for management purposes, course adjustments, and future designs. .
USAID LEARNING LAB challenges YOU to kick off 2018 by integrating a new CLA practice into your work, or be more intentional and systematic about an existing CLA practice. You can participate as an individual or a team. USAID - the lead U.S. Government agency that works to end extreme global poverty and enable resilient societies to realize their potential (*) - supports robust efforts to foster Collaboration and Capacity Development, - to inform adaptation of programs, projects, and activities (as well as the business processes that support them), and to improve development results. Through its LEARNING LAB Online Training, the USAID aims to empower organizations to generate an Action Plan (for their own priorities) and to secure strong commitments (through Collaboration - Learning and Adaption) to carry out the identified actions. Collaborating: Are we collaborating with the right partners at the right time to promote synergy over stove-piping? Learning: Are we asking the most important questions and finding answers that are relevant to decision making? Adapting: Are we using the information that we gather through collaboration and learning activities to make better decisions and make adjustments as necessary? Enabling Conditions: Are we working in an organizational environment that supports our collaborating, learning, and adapting efforts? A free online CLA TOOLKIT - accessible though LEARNING LAB - houses practical tools, examples of what CLA looks like in practice and official guidance on how to plan for CLA programming. The CLA itself can be seen as a Conceptual Framework for some principles and operational processes - to guide any important performance area. Particularly, in CTA TOOLKIT you will find a growing set of curated tools and resources on Collaborating, Learning and Adapting to help you plan and implement Program Cycle activities more effectively. In particular, the CLA Community of Practice is a collaborative space, where members ask questions, share their experiences and receive guidance around developing and integrating CLA in their programs. 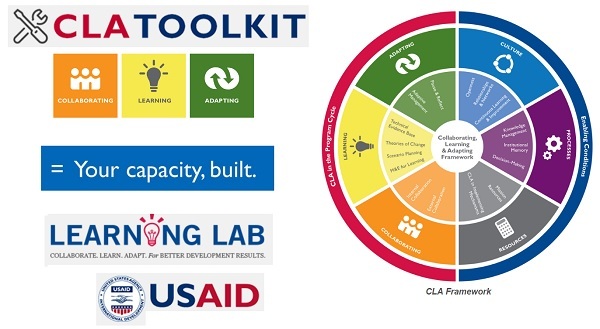 To hear what’s working well, what one is struggling with, and what one has learned along with CLA TOOLKIT approaches, USAID LEARN has also launched the CLA Case Competition, open to all types of individuals and organizations working with USAID (see: USAID: Get involved). USAID works in over 100 countries (in Africa, Asia, Europe & Eurasia, Latin America & the Carribian, Middle East, of Afghanistan and Pakistan) to: advance food security and agriculture; improve global health and environmental sustainability; promote further education, among others. To ensure that agricultural investments are sustainable and country-led, USAID is supporting AGRICULTURAL CAPACITY DEVELOPMENT on farms and in the private sector, producer organizations, research and extension institutions, government agencies, rural financial institutions, and civil society.